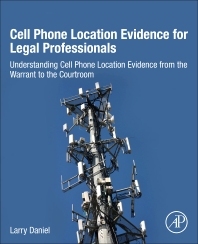 Cell Phone Location Evidence for Legal Professionals: Understanding Cell Phone Location Evidence from the Warrant to the Courtroom is a guide, in plain language, for digital forensics professionals, attorneys, law enforcement professionals and students interested in the sources, methods and evidence used to perform forensic data analysis of cell phones, call detail records, real time ping records and geo-location data obtained from cellular carriers and cell phones. Users will gain knowledge on how to identify evidence and how to properly address it for specific cases, including challenges to the methods of analysis and to the qualifications of persons who would testify about this evidence. This book is intended to provide digital forensics professionals, legal professionals and others with an interest in this field the information needed to understand what each type of evidence means, where it comes from, how it is analyzed and presented, and how it is used in various types of civil and criminal litigation. Relevant case law are included, or referred to, as appropriate throughout this book to give the reader an understanding of the legal history of this type of evidence and how it is being addressed by various state and federal courts. This book is written in a manner which makes sense in terms of applying its information to your cases. Not hyper technical and mind numbing but well written for its audience.